Texts on the new E Ink Pearl HD display with a resolution of 1024 x 758 pixels and 212 dpi now look even better and brighter! E Ink screens do not glare in the sun, and innovative diod frontlight lets you read comfortably even under low light conditions. Due to the higher refresh rate turning page speed has decreased significantly at PocketBook Touch Lux. Elegant smooth lines of the body, high quality materials used are well combined in the new PocketBook Touch Lux. The front panel is made of high quality matte plastic, the back on is soft-touch plastic covered for a comfortable one hand grip. The model is available in three colors: white, silver and black. 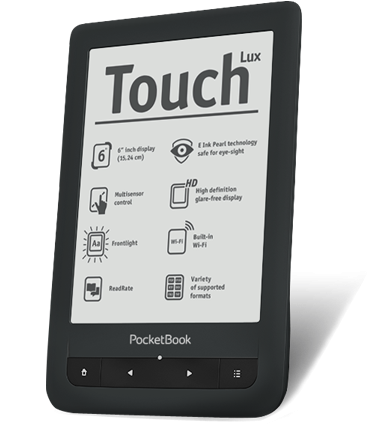 Due to the unique multi-sensory display and intuitive interface using PocketBook Touch Lux is incredibly easy! The new model has well developed custom menu, listening to audio files has also been improved (playlists option added). The main menu is organized as the recent events line, which includes the activity at ReadRate search and rating service and the history of books viewed and read. Reader is equipped with an advanced search and download applications, integrated into social networks, has a web browser (flash and cookies, scrolling and zoom support). And yeaahhh…, built-in Wi-Fi opens up limitless opportunities not only for reading! Lots of opportunities. Use’m all! 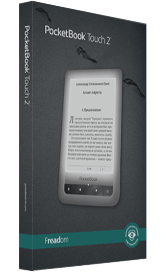 PocketBook Touch Lux reads without conversion 16 book formats (EPUB DRM, FLUB, PDF DRM, PDF, FB2, FB2.ZIP, TXT, DJVU, HTM, HTML, DOC, DOCX, RTF, CHM, TCR), 4 graphic formats (JPEG, BMP, PNG, TIFF), and also supports MP3. One battery charge is enough for 8,000 page turns - which is almost a month of active reading! 4 GB of internal memory, expandable up to 32 GB – an entire library at your fingertips! 9 dictionaries pre-installed on the device, 30 interface languages, 18 fonts (with the possibility of extra installing), has a Text-To-Speech feature. Any PocketBook device has a warranty and post-warranty support in a wide network of service centers, as well as our contact center.